Glen Boss has won the Doncaster Mile for the seventh time after saluting on lightweight Brutal. 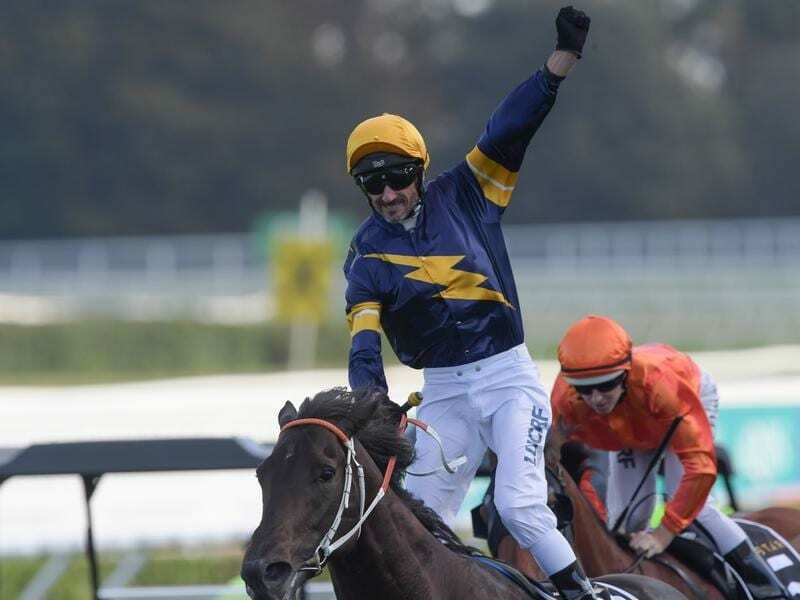 Riding at his lowest weight for 10 years, Glen Boss has steered three-year-old Brutal to what he describes as the easiest of his record seven wins in the Doncaster Mile at Randwick. Now domiciled in Singapore, 49-year-old Boss jumped at the opportunity offered by Hawkes Racing to ride Brutal on Saturday at 49.5kg, the weight he rode aboard So You Think in the first of his two Cox Plates in 2009. “I’m in awe of the colt,” Boss said. “I know they’ve got light weights and he got himself in a spot but he just cantered to the 1000 metres. “He just felt confident underneath me. There was never a point in the race when I thought I was going to lose. For the Hawkes family, it was also like turning back the clock with patriarch John Hawkes claiming the race in 2000 when Darren Gauci won on three-year-old Over who carried 51.5kg to beat Sunline. John Hawkes is now in a training partnership with his sons Michael and Wayne and the team had faith in Brutal who went to the race off a second to Winx in the George Ryder Stakes. “These owners have been fantastic for us,” Michael Hawkes said. “They’ve let us do what we wanted to do. Boss rode Brutal ($6.50) a half kilogram over his 49kg handicap and tracked the leader Dreamforce ($21) . The pair kicked clear in the straight and Brutal eventually got the upper hand by a length with Hartnell ($7.50) leading the rest of the pack another 1-1/2 lengths away. “When you’ve got 49kg you can do that,” Hawkes said. Boss, who won three Melbourne Cups on Makybe Diva, claimed his first Doncaster on Sprint By in 1996 with his others coming on Private Steer (2004), Racing To Win (2006), Haradasun (2007), Triple Honour (2008) and Kermadec (2015). “I’ve got grey hair and not much left but I’ve still got the passion to go the hard yards to do this thing,” he said. “To get down to the 49.5kg shows I’ve still got the drive to test myself. Victories like this make it all worthwhile. Damian Lane said he thought momentarily he might have pinched the race on the John Thompson-trained Dreamforce. “I thought he gave a really good kick at the top of the rise, almost a winning kick, but Brutal was too strong,” he said. Fellow jockey Hugh Bowman said Hartnell ran his usual honest race while Tommy Berry, who rode Japanese visitor Kluger to fourth place said he had done well. “He went enormous,” Berry said. “I think the speed of race is a little bit different here and probably 2000 metres would suit him better.